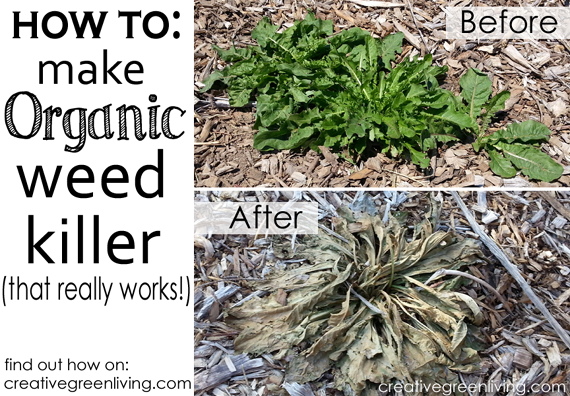 Nontoxic Weed Killer Recipe: Works Better Than RoundUp! Have you been using Round Up to kill weeds on your driveway or garden path? Did you know that Round Up is linked to infertility, cancer, thyroid issues and a collection of other health problems? Even if you don't spray it in your garden beds where you are growing food, the run off gets into our ground water - which in turn can get into our drinking water. Overall, Round Up is BAD BAD news! Stay away! What the makers of Round Up don't want you to know (in addition to all the health issues their product has been linked to) is that you can create your own weed killer at home with a few simple ingredients you may already have in your kitchen. It is non-toxic to kids and pets. Won't contaminate ground water and it really works. 1 gallon or larger Lawn and Garden Sprayer - be sure to use one that has not held chemicals previously. Also be sure to label it for organic gardening use only. I have one that I use ONLY for this purpose. WARNING: This weed killing mix is best used on places where you do not want plants to ever grow. Like in cracks on sidewalks, driveways, walkways. Do not use this in garden beds as the salt can make it difficult for plants to thrive for a long time after it has been applied. If you need to kill a lot of weeds or grass in a garden bed, follow this method instead. Watch your weather forecast and apply this on a day when it is sunny. The more warm and sunny the day is, the quicker it will kill the weeds. A day where it is not forecast to rain for several days in a row after application is ideal. 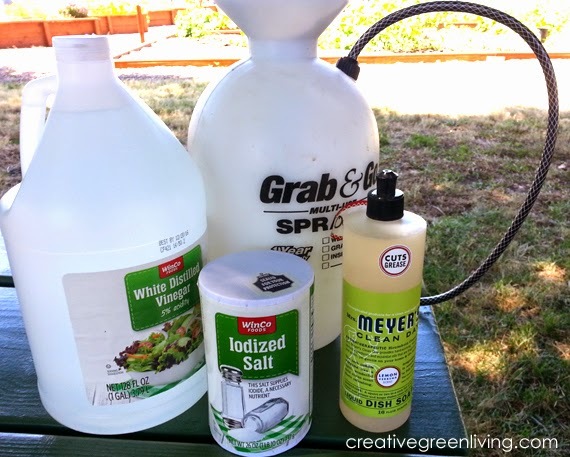 To your garden sprayer add the 1/2 canister of salt. Pour one gallon of white vinegar over it. Add approximately 1/4 cup dish soap. Screw the top on tight and turn it sideways, shaking gently back and forth to combine. Following the instructions for your sprayer, pressurize the inside so that it will spray out via the handle. Find a weed that needs to die and spray it well. Be sure to cover the leaves well with the weed killer solution. Once the leaves are well covered, I like to spray a little extra into the very center of the plant to help soak into the tap root. Leave everything alone to let the solution and the sun to work together to kill your weeds. 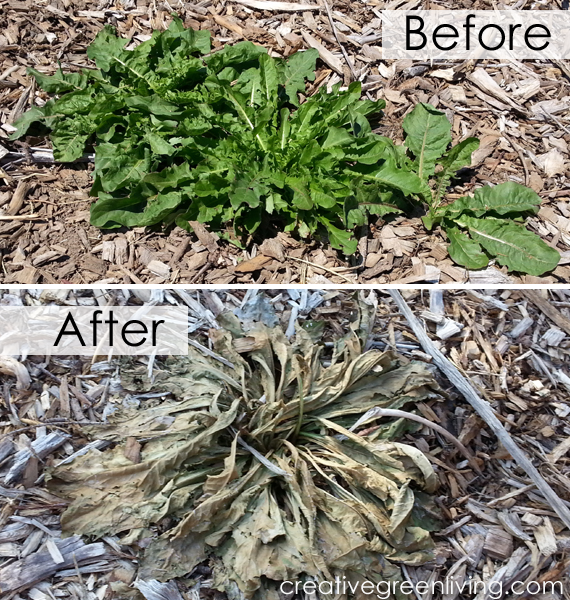 This is what a sprayed weed looked like after about 90 minutes in the sun on a hot summer day after applying this solution. If it is less than 80 degrees outside or your weed is not in a particularly sunny spot, it may take a little longer for your weed to die. That's ok. Just be patient. If your weed hasn't died after 24 hours, you can re-apply the solution again. Bonus: The weed killing solution also works well on moss! This is what I use during the spring to kill moss and it works great even if it's still grey and not very warm out. It just needs about 24 hours to work its magic. I just wish this would work on bamboo. I tried the 9% vinegar and salt, but didn't add the dish soap. When I ask my AG Extension agent, he responds; "Next question?" Bamboo is grass so even the really serious weed chemicals don't work because they are made to not kill grass, which is what bamboo is. Maybe I'll make one more attempt next summer with the dish soap. You are the first person to ask me about using it on bamboo. Because bamboo is so invasive via its root system and it is very very resilient , I would not expect this to have a lasting effect on bamboo. The only way to really get rid of bamboo is physical removal. I am going to try this. I read one site that suggested using bleach. One cup for a 6"x6" area. Surely that is a misprint. Yikes! I'm sure that is a misprint. ...although I can't say I would ever recommend using bleach to kill weeds. This specific formula is designed to kill weeds and keep things from growing in the area later. To kill weeds without also preventing other plants from growing, omit the salt--just use the soap and vinegar. Once the weeds are dead, water the area well to dilute any remaining vinegar and you should be good to go to plant grass seed.